Let's talk for a minute about the most dangerous dinosaur ever created. Indominus Rex? No, not even close! That's because Henry Wu kept on splicin' after the events of Jurassic World, and, well, he's cooked up an even more diabolical creation. All it took was the scariest parts of the Indominous Rex and the scariest parts of the Velociraptor, and, well, now you've got a real wicked dinosaur. We're talking like exponentially more dangerous! The Indoraptor is a stone-cold killing machine, and now it's got its sight set on eating our favorite Jurassic World characters. We might not be having that, but if your kid wants to get into the action? It's perfectly a-okay for them to suit up as the Indoraptor. Really! They can have plenty of fun suiting up as the new dinosaur, because it's just for Halloween fun. No gene editing here! 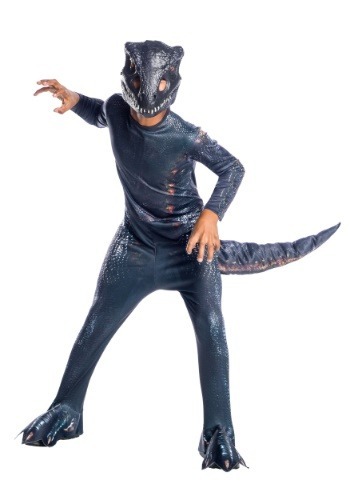 This Jurassic World: Fallen Kingdom Indoraptor Kids Costume is officially licensed from the 2018 movie. This costume ensemble comes with a jumpsuit and mask. The polyester jumpsuit is fully printed and has a tail that can be stuffed with newspaper or fiberfill for added effect. The suit also has integrated shoe covers that fit over the feet. Complete the fearsome appearance with the PVC mask. The dino details are sure to be a delightful Halloween fright! You know we're your top spot for movie costumes since we've got the world's best selection of costumes! Jurassic Park and Jurassic World costumes have always been one of our favorite categories, so you can be sure we've got all the costumes from the newest movie. Check out all of our Jurassic World costumes to outfit your entire family in Halloween style, and you can have an outright adventure, right in your own backyard! The costume arrived when it said it would. He loved the costume. The only reason I didn’t give it five stars was because the Velcro on the tail was falling apart after the first use. Good size, cool mask and the show covers/ feet are azome.